It was an honor being the Campus Director of world's largest student event for social change. I was extremely excited for the job I was chosen for; a perfect execution of a classic dream which I was always passionate about- social engagement to change the world for good. In retrospect, the journey was never smooth. Bringing substantial changes in cases where people are accustomed to a daily life routine was the biggest challenge I faced. Changing people's habits was even more challenging than managing the sponsors for the program. Here was a challenge that we happily accepted and now when we look back, the uphill struggle for the movement of social change in our university seems worth every drop of sweat, every second of time and each iota of energy spent behind it. The formation of the organizing team and the convening of the first meeting were done promptly. Then we realized that we had absolutely nothing in our coffers. It also dawned on us that in order to do everything we needed to do, immediate funding was of grave importance. But since we had a time constraint, we agreed to spend the initial money from our own pockets with the hopes of reimbursement after getting sponsors. It all began with announcements in social media and handing over posters and fliers. People started to know about it and soon- "Hult Prize: Nobel Prize for students" was the talk of campus. Everyday, we reached out to students in the campus for pitching. Teams started to register one by one- but still, the tally had not even reached 10 participating teams! It was time to change the marketing approach. We stepped up in-campus branding and promotions. We printed 10 big banners and colorful big posters and hung them around the campus, focusing on student hot spots. We advertised the event on Facebook. Our design team came up with the brilliant idea of making a big wooden board with a message chiseled on it and placed it at the side of the busiest road in campus. All of this hard work started paying off. Teams were registering at a much higher rate now. We were swamped with texts and calls. Lecturers shared about it with their students and in social media. It was the latest buzz around the campus. Soon the number of registered teams reached 50 and IIUM made it to the top 5 list in terms of students' participation around the world and got featured in the Hult Prize website. We were interviewed by our university radio and also got featured in our university website and newsletters.I can still recall the joy and sense of accomplishment among my team members- we had done it, the team had finally managed to pull it off. We had successfully involved ourselves in such a noble initiative for social impact that our university had never witnessed before. We had disrupted the entire scenario of students' engagement in our university and to me, nothing can beat that. The finale was all set for 15th December, 2015. All the hard work we had been putting forth for the past few months came down to this very particular day. We had finally acquired sponsorship, with MaGIC SE as our main sponsor, alongside technical partners Startup Malaysia and Entrepreneurship Development Centre of IIUM. The stage was set, awaiting the final showdown of the top eight teams, after they had gone through in-depth mentoring sessions to fine-tune and perfect their social enterprise models. The audience was packed, with people coming from different universities and various startup communities from all over Malaysia. After an intense battle among some of the most brilliant minds of the university, it was Team Better Future-Today who was the winner of first Hult Prize@ event at IIUM. 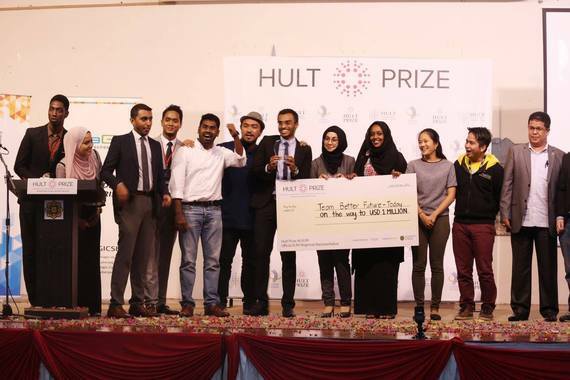 They solved the Hult Prize 2016 case with their smart idea of setting up money generating toilets in the crowded urban spaces which will also tackle the issue of sanitation in the slum areas at large. The judges were highly impressed by the presentations of the best ideas and insights aimed at alleviating poverty from around the world. Conducting the first ever Hult Prize@ event in my university was both a challenging feat and a great learning experience. The concept of Social Entrepreneurship has always fascinated me with its sheer potential to change the world for good. Implementing innovative ideas and doing sustainable business to make a positive impact in the society is something I have been always passionate about. Social enterprises can be an instrumental tool to curb the issue of poverty in the world and it's us the students who can play the pioneering role. Working with the students who were, initially, neophytes in the world of social entrepreneurship was one of the toughest tasks. But I was blessed to have the best possible organizing team by my side that prevailed through the tough times and came on top to make this event one of the top-performing Hult Prize@ events in the world. It is the force of the accumulated passion of all these ardent change- bringers, working together to uplift humanity on a whole new level that enables us to make a positive mark on the face of the world.